I admire Raven Theatre for many reasons. The staff and actors all seem to love what they do. And the highly diverse audiences seems to love watching the result. It’s a supportive and inviting atmosphere, and the last few shows I’ve seen there I’ve truly enjoyed. Plus, the seats are comfortable, the bathrooms are clean and it’s within walking distance from my home. Win! However, their current effort, William Inge’s Bus Stop, just didn’t do it for me. 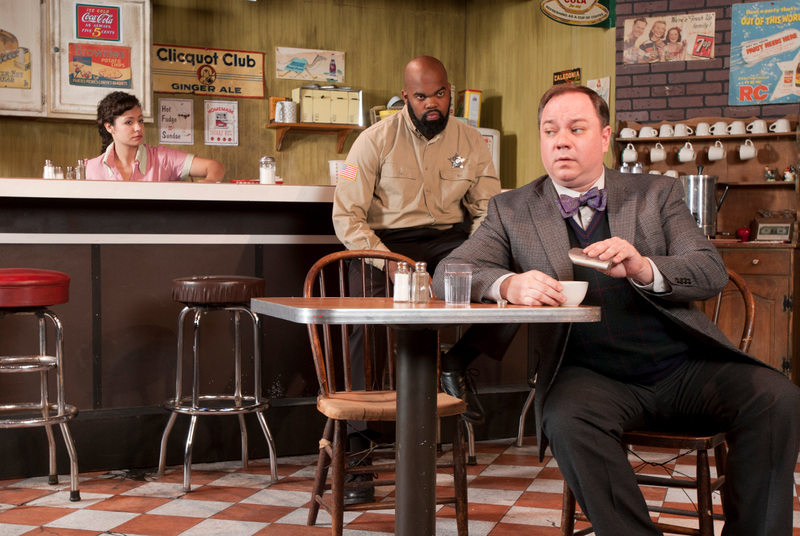 This show, about a group of colorful cross-country bus passengers stranded by a winter storm in a rural Kansas bus stop diner, requires tight ensemble work. And while standout performances from Jon Steinhagen (whose play Dating Walter Dante will receive its world premier at Raven once Bus Stop pulls out), Antoine Pierre Whitfield (as the fiercely protective Sheriff Will Masters), Kristen Williams (as wise-cracking diner owner Grace, a role originated by Elaine Stritch) and Mark Pracht (giving a wonderfully authentic and understated performance as Virgil) make an impact, it felt like this bus had left the station with a flat or two. Perhaps it was JoAnn Montemurro’s serviceable direction, Inge’s once-groundbreaking-but-now-dated script or Sophia Menendian’s painfully underwhelming performance in the pivotal role as naive and eager diner waitress Elma. I just didn’t connect. I will say Ray Toler’s set design is a mastery of detail and specificity — two core things lacking from this production overall. Other reviewers liked Raven’s Bus Stop. Maybe I just caught an off night? Maybe I was in a bad mood? Who knows. All I know is my favorite part of the evening was my lovely — and short! — walk home. Hey, Katy. There were moments that were entertaining, but it never came together as a satisfying whole. I’ve seen the plays years ago at my hometown community theatre. Check this for some other opinions. ps: I may be biased, I am related to a member of the cast. Hi, John. Thanks for commenting. Naturally, mine is just one opinion of many, so thanks for directing people to your thoughts. I have not seen the show yet, but will be headed out to Chicago this weekend. Thanks for an honest evaluation of your experience. Hopefully, mine will be better. I have just returned from Chicago. I was able to see Bus Stop twice, Friday and Saturday performances. You must have had a bad night. I found the show excellent. From the details of the set to the character interactions, this production was great. Seated next to us in the audience was a woman who performed in the show many years ago, as did her mother before her. As she exited the theatre at the end of the night, she sought out members of the cast in the lobby. She raved about the production’s keeping with the original spirit of the show, and the great performance by the cast. If you have the chance, you may want to see it again, maybe from another angle.